Today was a chilly, rainy, blustery day and when I got home I was in the mood for some "comfort food". 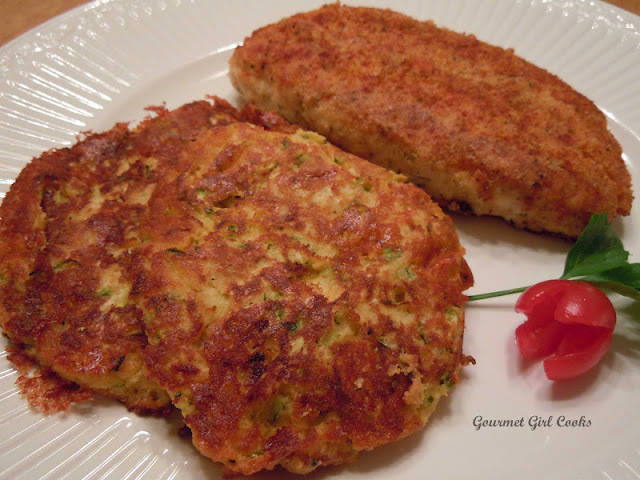 After taking a quick scan of the fridge, I decided to make Almond-Parmesan Chicken and Zucchini Cheddar Patties for dinner. 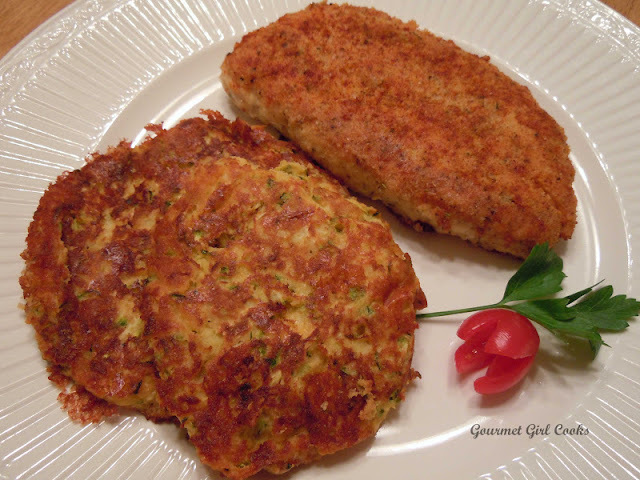 I've made both of these before, except I used a different kind of cheese in the zucchini patties. This time I used sharp cheddar cheese instead of the Italian blend cheese. Below I will re-post the recipes the way I made them tonight. It was a perfect meal for this damp blustery day we had. I had forgotten how much I liked the zucchini patties too and I really liked them with the cheddar cheese. One of my readers that made them a little while ago said they were a little salty for her taste, so I am removing the addition of salt from the recipe since the cheeses have salt in them -- it is easy enough to sprinkle on extra salt, if necessary, but you can't take too much salt out! Below are a couple of pictures as well as the recipes. Enjoy! Squeeze all excess liquid from grated zucchini (line a clean dish towel with several layers of paper towels; roll and squeeze until excess liquid is removed (or press in a mesh strainer. In a large non-stick skillet, heat a few tablespoons of oil, and/or butter (as needed) until hot. Drop heaping tablespoons of the zucchini mixture into the skillet, pressing lightly and cook on both sides until golden brown. Remove to plate lined with a paper towel to absorb any excess oil or butter. Serve immediately or keep warm on a parchment paper lined cookie sheet in a 325 degree F oven up to 30 minutes or so. If desired, season with salt. In a medium bowl, mix almond flour, Parmesan, a few shakes of sea salt, freshly ground black pepper, Italian seasoning, onion and garlic powder and optional cayenne pepper; combine thoroughly. In a small bowl, beat egg and a tablespoon of water or milk; season with salt and pepper. Dip chicken in egg wash and then coat well with the "almond breading" mixture on both sides; saute in a hot non-stick skillet coated with oil until golden brown on both sides and cooked through. Sprinkle lightly with paprika. ***Note: Chicken breast cutlets can be substituted for boneless breasts to reduce cooking time. Different seasonings can be added to the flour mixture to suit your own taste. Thanks Annie -- you are right, a salad would make it perfect! Would you mind sharing which brand/type of almond meal you use? Hi SheilStew -- I don't mind sharing it at all. What I use now is Honeyville almond flour -- it is finer than Bob's Red Mill (which I have used before) and Honeyville's is also blanched (no skins). I ordered it online and bought a 5-lb bag and have since ordered another 5-lb bag when it went on sale recently. It's a bit pricey, but seems to last a long time and I do a lot of cooking! Looks terrific. Thanks for the advice on the Honeyville brand. I've been buying Bob's Mill.